Persistence Market Research provides a detailed report on the Asia Pacific Peracetic Acid Market in a new publication titled, “Asia Pacific Peracetic Acid (PAA) Market” In this regional report, we have focused on the geographical importance of Asia Pacific and gauged its growth potential in the years to come. We have provided a bird’s eye view of the Asia Pacific Peracetic Acid Market and assessed the core competencies of this market. We have checked the segments of this market and provided a critical assessment of the scope available to all the major shareholders operating in this massive regional market. In this periodical forecast, we have tried to pull out different factors that might impact the growth of the Asia Pacific Peracetic Acid Market in the forthcoming years. Out team of analysts has studied the market extensively and identified the drivers, restraints and trends that will probably redefine the market psyche in the long run. We have studied the major and second line players operating and dominating certain portions of the Asia Pacific Peracetic Acid Market. As we know market dynamics do have an important role to play in shaping the destiny of any market; in this report we have considered the market dynamics very seriously to understand the forward movement of the market. We have studied the market strategies of the major players and tabled these to draw a clear picture of the Asia Pacific Peracetic Acid Market. This regional analysis gives a vivid description of the Asia Pacific Peracetic Acid Market. The report starts with key definitions, executive summary, market taxonomy and a detailed overview of the Asia Pacific Peracetic Acid Market. 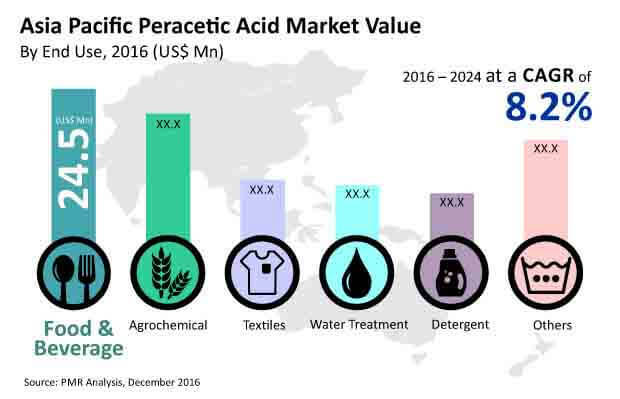 In the executive summary, we gave a 360 degree view of the Asia Pacific Peracetic Acid market. In the taxonomy segment, we dissect the market into different sections. In the following section of this report, we identify the drivers, restraints and trends that are likely to impact the growth of this market within the period of forecast. In the next chapter of the report, we try to understand the market size and provide the data related to the volume and value of the market. In this regional report, we have not only highlighted the development potential of Asia Pacific as a region but we have also talked about each country and individual country contribution expected to stretch the boundaries of the Asia Pacific Peracetic Acid Market. We have reserved the last section of the report for the major shareholders of the Asia Pacific Peracetic Acid Market. We have analyzed their market performance within the anticipated period and have also done an in-depth study of their short-term and long-term business goals that would also impact the fabric of the Asia Pacific Peracetic Acid Market. This section is intended to provide a dashboard view of the competitive landscape of the Asia Pacific Peracetic Acid market. Persistence Market Research has leveraged secondary research to ascertain the overall market size, top industry players, top production methods, and end uses of the Asia Pacific Peracetic Acid Market. Apart from secondary research, our experienced team of market analysts spoke to several industry insiders such as manufacturers and retailers to understand the market in a better way. We then sliced and diced mammoth data related to the Asia Pacific Peracetic Acid Market accumulated through primary and secondary research and then validated this data using the triangulation method. The data was then scrutinized to obtain qualitative and quantitative insights about the industry. Metrics curate the base of a report. The report on the Asia Pacific Peracetic Acid Market talks about all the major metrics to provide an extended picture of the market. The report uses this accumulated data to compare and contrast the performance of the market across geographies. As a research firm, we know that every market is volatile and the overall performance of any market is completely dependent on the unpredictable, sporadic changes that occur in regional and global markets. The report estimates the CAGR of the regional and global markets and also notes down the Y-O-Y spike of the Asia Pacific Peracetic Acid Market to understand the right opportunities and the climate of the market. The research adopts a multi-dimensional approach to measure the embryonic growth of the regional markets. This detailed approach towards the market helps understand the significant trends likely to dominate the market in the forthcoming years. Another notable feature of this report is an analysis of the revenue forecast of the Asia Pacific Peracetic Acid Market in terms of absolute dollar opportunity. While this is usually overlooked when forecasting the market, we believe absolute dollar opportunity analysis is critical in assessing the level of opportunity that market providers can look to achieve and also to identify potential resources in the Asia Pacific Peracetic Acid Market. The report further dissects the different market segments on the basis of their individual performance and growth graph. The market attractiveness index at the end is included to help market shareholders identify the future and present scope of growth of the Asia Pacific Peracetic Acid Market. The report on the Asia Pacific Peracetic Acid Market provides a complete market outlook for the period 2016-2024. Markets are tracked on country level; the market numbers are derived using the top-down and bottom-up approach. Sales of Peracetic Acid is tracked on an annual basis. Peracetic Acid market sales at a segment level are closely studied and referred to ascertain market size at each country level. Growing demand for peracetic acid owing to its strong bleaching and disinfecting characteristics has made it a superior substitute to other chemicals available in the market. Peracetic acid degrades into oxygen, carbon dioxide and water which makes it an ecofriendly product. These core characteristics of the chemical and rising concerns over environmental issues is expected to fuel the Asia Pacific Peracetic Acid market. Sales of peracetic acid reached a value of more than US$ 82.3 Mn in 2015 and are anticipated to increase at a CAGR of 8.2% over the forecast period and are likely to cross US$ 164.2 Mn by 2024 end. Peracetic acid (PAA) offers high efficiency as a bleaching and disinfecting agent compared to other substitutes available in the market. The food and beverage section of the Asia Pacific peracetic acid market is anticipated to expand at a CAGR of 9.1%. Agrochemicals, others and detergent segments are expected to record healthy CAGRs within the foreseen period. The EPA (Environmental Protection Agency) has exempted the residual value of peracetic acid in the food and beverage industry as it breaks down into water, oxygen and carbon dioxide. EPA operates actively in countries such as China, Indonesia, India, Australia, Japan, Korea and Singapore. Peracetic acid is one of the chemical disinfectants used to kill pathogens and decompose the organic of medical waste. Peracetic acid can deal with pathological waste and drug waste as well. These qualities of the chemical are likely to impact the market expansion of the Asia Pacific peracetic acid market. In the end use segment the food and beverage industry is likely to account for more than 26% value share by the end of the current year. It is expected to gain 210 BPS by the end of the assessment period. The others segment including dairy products, household cleaning solutions and cosmetics is projected to lose 10 BPS over the forecast period. Agrochemical end-use segment is projected to observe a slow growth over the period of forecast. The Y-O-Y growth rate by end-use shows an in-depth picture of the Asia Pacific Peracetic Acid market. Food and beverage industry in the end use segment is likely to progress rapidly during the forecast period. Agrochemical industry is likely to witness a significant surge till 2020, but the upward march of this segment will take a nose dive by the end of the period of assessment. Others segment is also fated to witness progress and this segment will grow at a collective rate of more than 13% by the end of 2024. Food & beverage segment is anticipated to incline toward high value–high growth during 2016–2024. This is mainly attributed to increasing demand for aseptic packaging for food products and beverages. Increasing demand for agrochemicals in the agriculture sector is expected to drive the demand for peracetic acid. The agrochemical segment is estimated to incline towards high value–high growth during 2016–2024. Water treatment segment is likely to incline towards high value–low growth during 2016–2024. The food and beverage segment in the China PAA market is expected to gain more than 200 BPS within the period of forecast. Lenient government regulations and bulk production is predicted to expedite the peracetic acid market growth in China. Agrochemical industry will showcase a fairly moderate growth in the dragon economy as it might lose more than 55 BPS over the forecast period. Owing to a robust agro-based economy, the agrochemical segment in India was expected to soar till the end of 2016, but the market might lose more than 45 BPS within the period of forecast. Others segment is predicted to continue its growth march in the Indian market, while the water treatment segment is projected to incline towards high value-low growth during the forecast period for decreasing use of peracetic acid as a disinfectant solution in the near future. In Japan’s peracetic acid market the others segment will probably witness good growth and is expected to gain more than 8BPS by the end of the forecast period. In ASEAN countries the others segment is anticipated to incline towards high value-high growth followed by the food and beverage segment during the forecast period. In Australia and New Zealand, the food and beverage segment is likely to gain more than 145 BPS over the period of forecast. In the rest of Asia Pacific, the food and beverage segment is projected to emerge as the largest market segment with high growth.